Best Plan of Action for Fig Bush Cuttings? 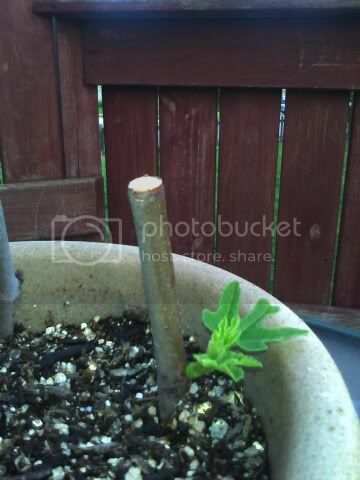 We visited my wife's grandparents a couple weeks ago in Baltimore, and I took a clipping of her Grandfather's fig bush to grow for her, here in Indiana (zone 5). She has good memories of him picking figs for her to eat when she was little. Well the clippings are split up into six in a pot with about 60 pct vermiculite, and 40 pct potting mix--and now they are starting to sprout new leaves. So my question is this: should I keep the plant in a pot, inside over winter, and plant it outside in the spring after some hardening off (I guess? ), or should I just plant it, and let it go? The bush it came from is twenty or more years old, and overwinters in Baltimore, coming back with a vengeance every year. PS- Baltimore is zone 7, and I sit right on the zone 5a/5b line. I don't know how hardy your fig is, but do know that with a brown turkey, even here in S.C., any green stems will get killed during the winter. If living in zone 5, I would let the first couple of frosts kill the plant back and then would let the fig over winter in a garage or other area out of the direct cold, maybe even under the house. If such a place is not available, then place the plant horizontally and completely cover the plant, to be removed after weather settles in the spring. Once the fig has growth that turns grey/brown and woody, that growth should survive down to normal hardiness temperature tolerances. If your zone is too cold for the particular fig type, it may still grow but get killed back to the ground every year. If you know the fig variety, then perhaps do a little research to find how it is rated in zone 5. Personally, when I start a fig from cuttings or from layering, I let them grow in a container for two or three years, so that when they go into the ground, the plants are strong and vigorous. My plants are started in 1 gallon containers then are up potted to 3 gallon containers, and from that point either go into a 5-7 gallon or go to their final location in the ground. Last edited by hendi_alex on Tue Jun 28, 2011 1:56 pm, edited 1 time in total. in your area, even with extreme freeze-protection measures, it'll winterkill back a ways, maybe to the ground, yearly. in most cases they'll still come back each year, and sometimes even yield fruit, but with something of such sentimental impact, having it die back every year and *hoping* that it would make it through and come up again...probably worth the extra trouble of potting and babying. I grow several figs in containers, and they do produce a few figs each year, so that is an option. All I know about variety is that bears black figs. Thanks for the replies. I want it to bear fruit for sure. The bush it comes from is huge and bears tons of fruit. Maybe I'll transplant some of the cuttings into the ground, and some into a big pot. Started to do a little research and MAN, there are a TON of different varieties. I think I'll have to see fruit before I can determine what it is. ^even then, it may be tricky. My plan is to pot some cuttings into a really large pot, and some into a medium sized pot. I'll keep the one in the big pot in the pot and transplant the other one in the ground next spring--just need to pick the spot. If you can plant the fig beside the house on the south side, and protected from the wind it will give the best shot at doing well outside. Alex, maybe you can provide some more input since you have some experience with figs. In my researching growing figs for my area, I came across recommendations for growing further north that included completely covering the entire tree/bush with a mini-greenhouse/hoop house made from PVC pipe or conduit, then covered in plastic, then completely stuffed with leaves so the tree has a minimum of 6 inches of dry leaves beyond the tips of each branch. Do you think this is a viable option for the plant Graham wants to put in the ground? If he decided to do this hoop house option, I would guess he should wait for a frost to send the fig into dormancy before doing this, is that what you would recommend? Alex, since you're volunteering information, perhaps you have a variety you could recommend for me? I've been reading about different varieties and the "Celeste" looks like a good option for the Dallas area. Have you grown this variety? How's the flavor, insect/disease resistance, production, etc? Brown Turkey does well though out much of the country. Celeste also does well here in zone 8 and is one of the varieties that I'm growing, but only in a container for now. I think the best bet for deciding on a variety for your area is to consult the local agricultural extension office. That is where I did my initial screen and came up with brown turkey and celeste. Now I'm just trying a few others for variety. I bought one plant from a local nursery. It was labeled as celeste but the figs are enormous and almost black when ripe. Very sweet and mild. Don't know the variety, but is a special fig and is doing well in its large container. I'm planning on putting it in the ground on the west side of my greenhouse. Alma is another high quality fig that you may want to consider. It originated in Texas. Though I have never had to take heroic action to overwinter a fig tree, I was considering a suggestion similar to the protective tent mentioned in your post. The tree can also be tied into a bundle and covered with something like a trash can with the bottom removed. Fill that with leaves or other insulating material and the top growth can withstand much colder temperatures than their zone rating. That is quite a bit of trouble for a small tree however. It really depends upon the motivation of the gardener as to whether that is too much trouble or not.